"That's her - the other woman." Amazon + Roadside have unveiled the first official trailer for The Only Living Boy in New York, the second film from director Marc Webb being released this year (his other one is Gifted starring Chris Evans). The Only Living Boy in New York is about a recent college grad, played by Callum Turner (also seen in Victor Frankenstein, Assassin's Creed), whose big city life is thrown into disarray when he discovers his father has a mistress. This also stars Kate Beckinsale, Pierce Brosnan, Kiersey Clemons, Cynthia Nixon, and Jeff Bridges. This looks solid, a bit funky, with a mix of tones that may or may not work. I like Jeff Bridges as the older guy dispensing wisdom, I'll be hoping for the best. 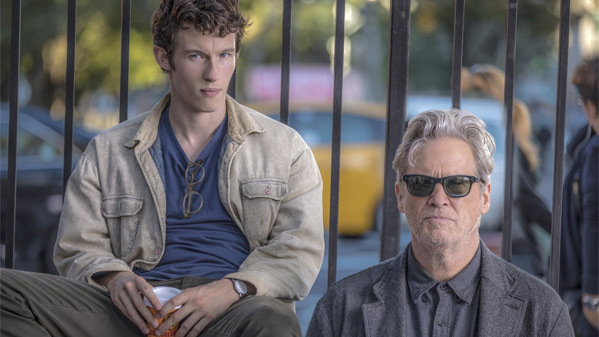 Adrift in New York City, a recent college graduate (Callum Turner) seeks the guidance of an eccentric neighbor (Jeff Bridges) as his life is upended by his father's mistress. The Only Living Boy in New York is directed by American filmmaker Marc Webb, of the films 500 Days of Summer, The Amazing Spider-Man 1 & 2, and this year's Gifted previously. The screenplay is written by Allan Loeb (Things We Lost in the Fire, 21, The Switch, Just Go with It, Rock of Ages, Collateral Beauty). Amazon Studios + Roadside Attractions will release The Only Living Boy in New York in select theaters starting on August 11th later this summer.